5 years bak, condition of IBM was not exactly in great condition around cloud. When IBM started Bluemix PaaS, Heroku like PaaS was more acceptable. It is practical fact, today with data sciences, big data, PaaS; IBM has lot of things to offer. Their major deficiencies was possibly understanding the need of the developers. IBM recently announced open source Grafeas project to help developers with security of containers, released Open Liberty, which is a new lightweight, open-source version of its WebSphere Liberty Java application server. The new IBM cloud private software based on containers, microservices and APIs designed to create cloud native applications for on-premise. It is very much true, today computing over the network is much dependent on containers, microservices and APIs. What This New IBM Cloud Private Software is Offering? IBM is a founding member of the Cloud Native Computing Foundation, which hosts Kubernetes and Cloud Private is in compliance with its interoperability conformance tests. 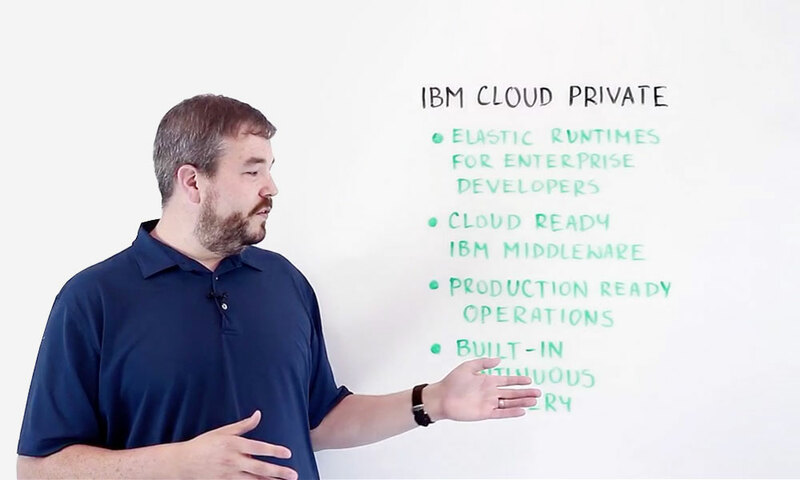 IBM Cloud Private software is designed to create on-premise cloud capabilities similar to the public clouds to accelerate application development. This new platform is built on the open source Kubernetes-based container architecture and supports Docker containers and Cloud Foundry. So, in essence, users of IBM Bluemix will not face much difficulties in getting used with development and deployment. This likely to facilitate the integration and portability of workloads to any cloud environment including that of IBM Cloud. It includes multi-cloud management automation, security scanning, data encryption and has the way to deploy with VMware, Canonical or OpenStack. As far is known, this software has support for most of the DevOps tools. The capability of integration with OpenStack definitely a great point in terms of integration of infrastructure. As cost of dedicated servers are declining, in future it will be easy for any developer to integrate and use the tools at far lower cost compared to the time IBM started cloud journey. This Article Has Been Shared 856 Times! Cite this article as: Abhishek Ghosh, "New IBM Cloud Private Software Based on Containers, Microservices and APIs," in The Customize Windows, November 14, 2017, April 21, 2019, https://thecustomizewindows.com/2017/11/new-ibm-cloud-private-software-based-containers-microservices-apis/.